Wolf Commercial Real Estate, the foremost South Jersey commercial real estate broker that specializes in South Jersey commercial real estate listings and services, is now offering prime South Jersey land for sale in Burlington NJ. 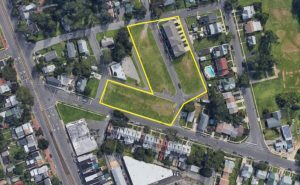 This land for sale in South Jersey is an approximately 1.48-acre parcel at Washington Square (Washington and Juniper streets) Burlington NJ. There are 31 fully approved residential lots on this land for sale in Burlington. This land for sale in South Jersey at Washington Square (Washington and Juniper streets) Burlington NJ is situated in a redevelopment zone and there is tax abatement available in connection with this South Jersey land for sale. The asking sale price for this land for sale in South Jersey at Washington Square (Washington and Juniper streets) Burlington NJ is $275,000. This South Jersey land for sale is available through Wolf Commercial Real Estate, a South Jersey commercial real estate brokerage firm with expertise in South Jersey commercial real estate listings and services. This land for sale in Burlington is close to the Burlington Bristol Bridge and all major highways. This South Jersey land for sale at Washington Square (Washington and Juniper streets) Burlington NJ is in the center of historic Burlington City. Nearly 192,000 residents live within five miles of this land for sale in Burlington. The average household income in the same radius of this land for sale in South Jersey is $70,574. For more information about this South Jersey land for sale at Washington Square (Washington and Juniper streets) Burlington NJ or about any other South Jersey commercial properties for sale or lease, please contact April Loomis (856-857-6308; april.loomis@wolfcre.com) at Wolf Commercial Real Estate, a South Jersey commercial real estate brokerage firm.